Sudoku solver approaches Sudoku as a constraint satisfaction problem to find solutions. Various constraint approaches were used and their results were tested in compaired. A write up is included on the page. 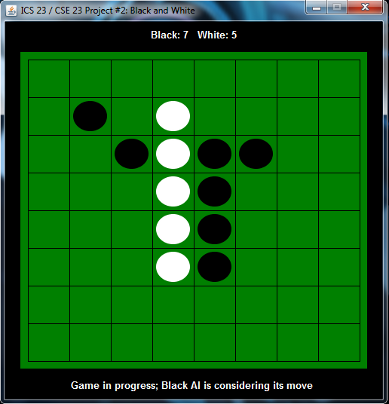 Othello AI implements variable height tree search in a game tree plus programmer-developed heuristics (such as peice count) for the game Othello. The AI is included in an executable jar with a playable game of Othello where you can go against the AI or watch the AI play itself!